I am currently working on a plugin that needs to receive some information from an LDAP/Active Directory using JNDI. That’s why I needed to set up a directory server in a short time and I didn’t want to waste much effort for here. Luckily for me the Apache Directory Studio saved my day and allowed me to set up everything I needed in a few minutes. Short and sweet: In this tutorial I’m going to show you how to configure everything you need in your Eclipse IDE and finally how to query the created LDAP server with a tiny java client using JNDI. 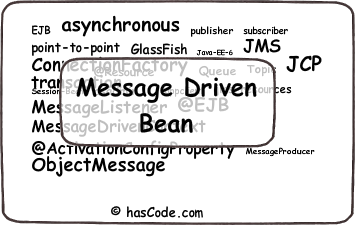 Message Driven Beans are no new concept due to the fact that they exist since EJB 2.0 but in Java EE 6 and the EJB 3.0 specification it is even more fun to use them. In this tutorial we’re going to take a look at the specification and create an example application that transfers some objects via the Java Message Service to a Message-Driven Bean deployed on a GlassFish application server. If you’re not interested in theory please skip to chapter 6 and directly start creating an application – otherwise we’ll begin with a short introduction into the JMS terminology and the concept of a Message-Driven-Bean..